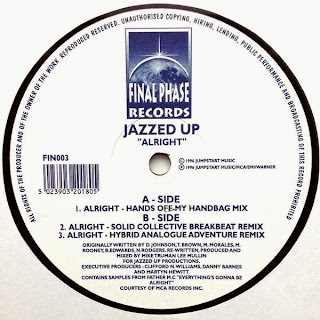 And This Is What You Get When You Least Expect It: Jazzed Up - Alright 12"
Jazzed Up - Alright 12"
This is the 1996 Final Phase Records 12" for the work by Mike Truman and Lee Mullins (otherwise known as two of the founding members of Hybrid). 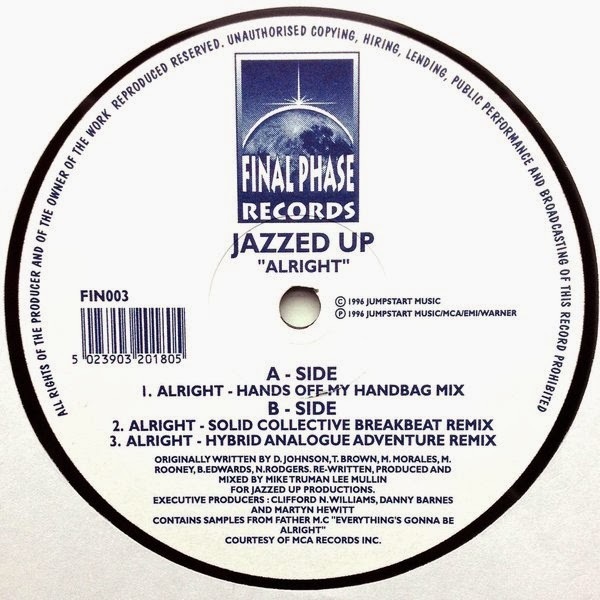 The A side mix is a "handbag" style tune with stomping beats, storming piano lines and is chocked full of the uplifting Father MC sample. This version is a concise snapshot of a short lived musical genre that was in style during the early to mid 1990s. The B side starts off with the Hybrid boys remixing the tune under the lesser known Solid Collective alias. This mix is a breakbeat interpretation that uses some of the same sonic elements that were used in the now legendary track "Symphony", along with some more rave-y sounding stabs that push the energy level of this remix way up. It's a stormer of a cut with an overwhelming amount of positive vibes soaked in. The second remix is listed under the Hybrid moniker and adds yet another dimension to the sonic pallet of this single. Taking a solid 4/4 approach and running the tune into the red, the mix does what the previous mix does and builds itself into a towering piece of dancefloor goodness. All three mixes are here for your listening pleasure. Hey,always great work with the site, hope you stop by soon and keep us updated with great tracks from the recent past! Your FIRE label post ( quite some time back) made me go out and buy a dozen of those records. Looking forward to some good insights on tunes i missed.